Start by browning the lamb. Mmm…it’s been a while since I’ve cooked lamb. I love the way it smells. When the meat has been browned on all sides, pull it out of the pot and start building your braise. Sauté chopped carrot, celery, and onion. Add a few squirts of tomato paste and a couple of chunks of ginger root. Toast crushed fennel seeds and a pinch of red pepper flakes. Splash in some red wine and return the lamb to the pot. Add some chicken stock to almost cover the meat, then bring it to a simmer, cover, and pop it in a low oven until the meat is just barely holding onto the bone. When the meat is done, pull it out and tent it with foil while you take care of the finishing touches. Pour the braising liquid through a sieve to remove the chunks of vegetables. Put the strained liquid back on the pot, add the raisins, and return to the stovetop. 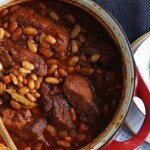 The raisins will plump as the delicious pan juices reduce into an incredibly flavorful sauce. While that’s happening, mix up a gremolata. 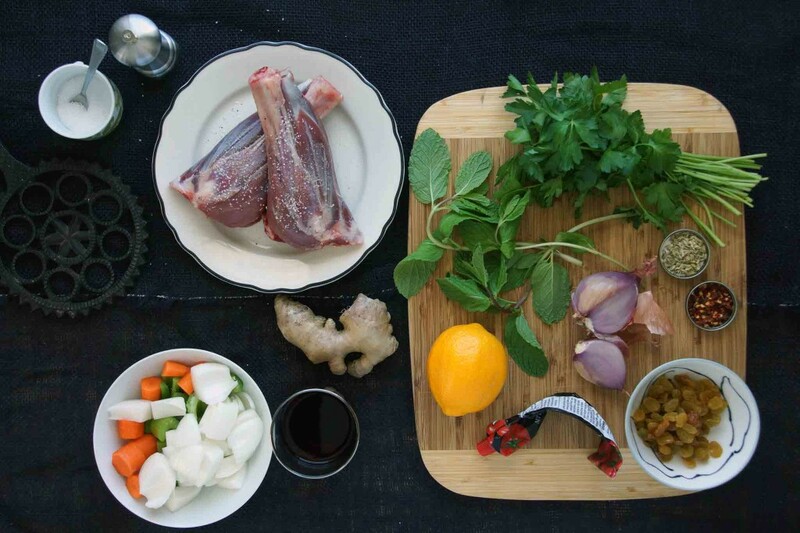 Traditionally, gremolata is a condiment of fresh parsley and lemon that is used to garnish osso buco. I love sprinkling it over all sorts of braised meats to add a fresh highlight. I made this one with parsley, mint, shallot, and minced Meyer lemon peel. Put the shanks back into the pot to take a quick swim through the sauce before you plate it all up. 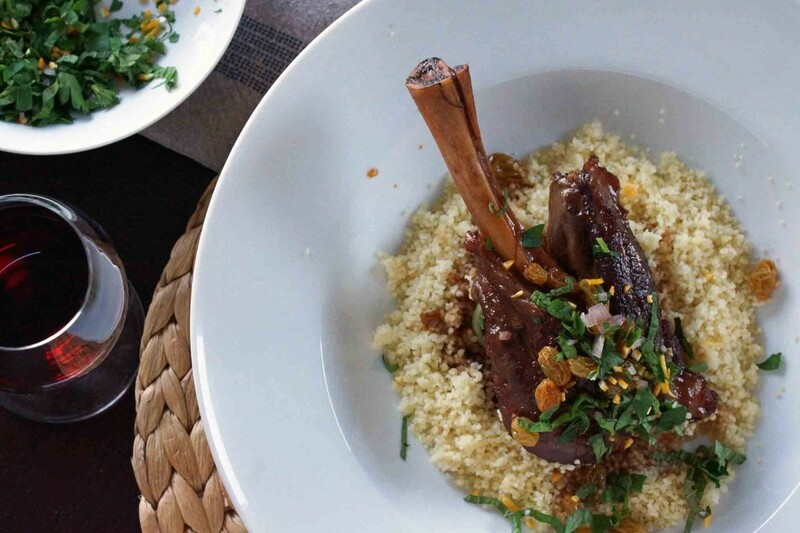 I served the shanks over a mound of couscous to absorb all of the juices. And there we go, another gift from my Dutch oven. 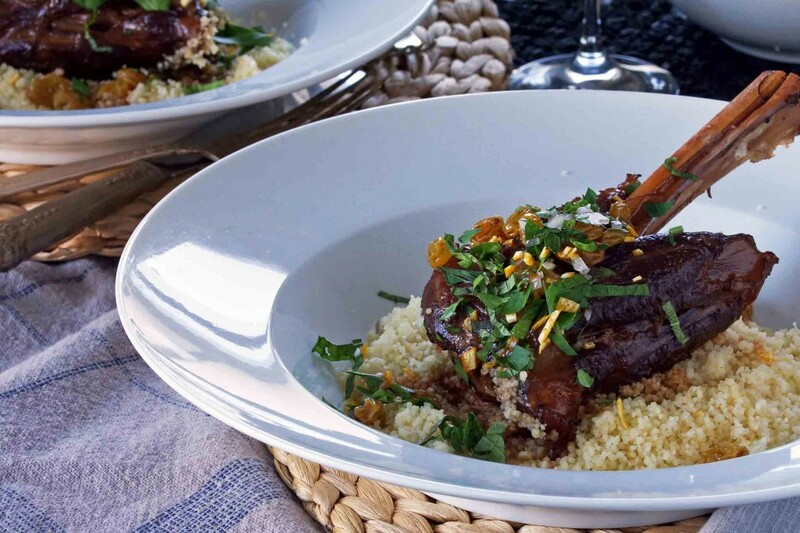 A refreshing mint and Meyer lemon gremolata provides a fresh counterpoint to the rich, spiced braised meat. This is one of the best dinners we've had so far this winter! Preheat oven to 325° with a rack positioned in the lower third. 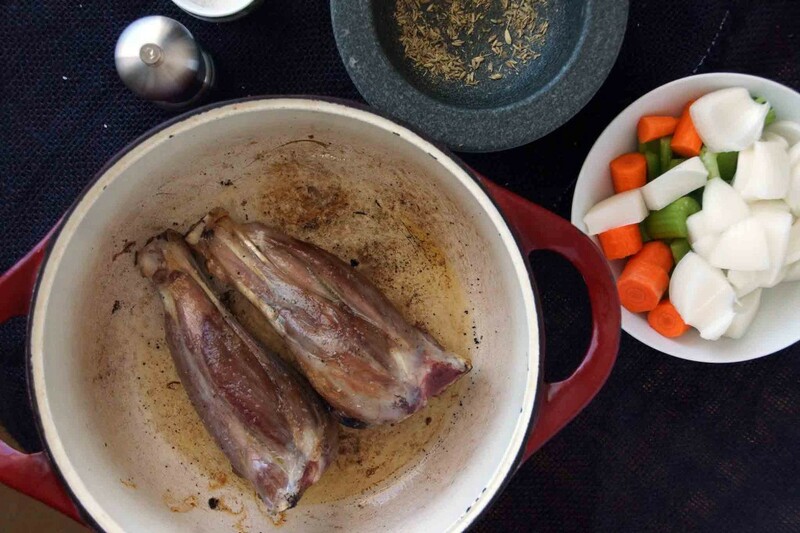 Rub the lamb shanks liberally with kosher salt and black pepper. Heat the olive oil in a Dutch oven. Add the lamb shanks and brown on all sides, about 8 minutes total. Transfer the lamb to a plate. If there is more than just a thin coating of fat in the pot, pour off any excess. Add the chopped onion, carrot, celery, and ginger to the pot, season with a pinch of salt, and sauté over medium-high heat until the vegetables soften slightly and the onions are slightly golden, 6-8 minutes. Move the vegetables to one side of the pan. Drop the tomato paste into an empty spot and allow to cook for a moment; in another empty spot, toast the crushed fennel seeds and red pepper flakes for a minute. Stir the tomato paste and spices into the vegetables, add the red wine, and bring to a boil. 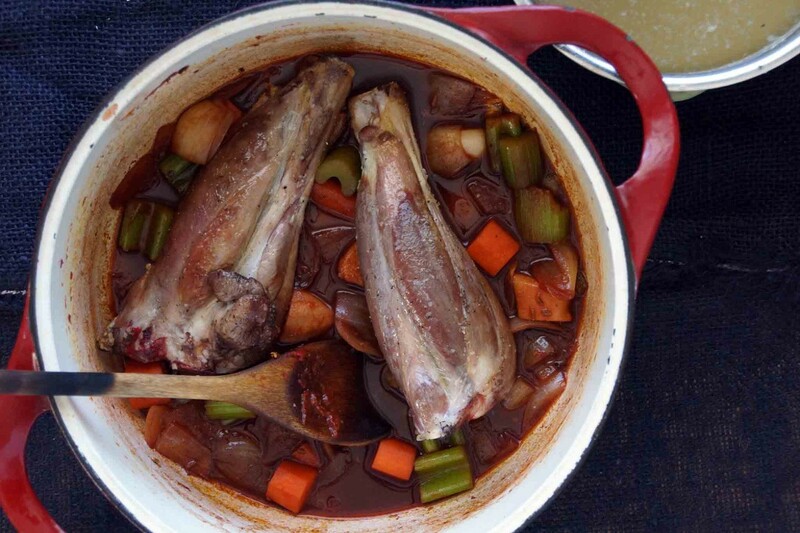 Return the lamb shanks to the pot, nestling them among the vegetables. Add chicken stock to almost cover the meat. Bring the liquid to a boil, then reduce to a simmer, cover, and transfer to the oven. Braise, turning the shanks every half hour or so, until the meat is very tender when poked with the tip of a knife, but still attached to the bone. My not-huge shanks were fork tender after about 1½ hours; if you’re working with larger shanks, it may take a bit more time. 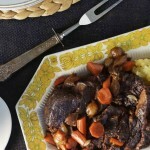 Remove the lamb shanks from the pot, transfer to a plate, and tent with foil. Pour the braising liquid through a mesh sieve to strain out the chunks of vegetables and the fennel seeds. Pour the liquid back into the pot and return to the stovetop. If there’s a lot of fat floating on the top, skim some off. Add the golden raisins and bring to a boil. Allow the raisins to plump and the liquid to reduce to a saucy consistency, about 5 minutes. Meanwhile, make the gremolata. 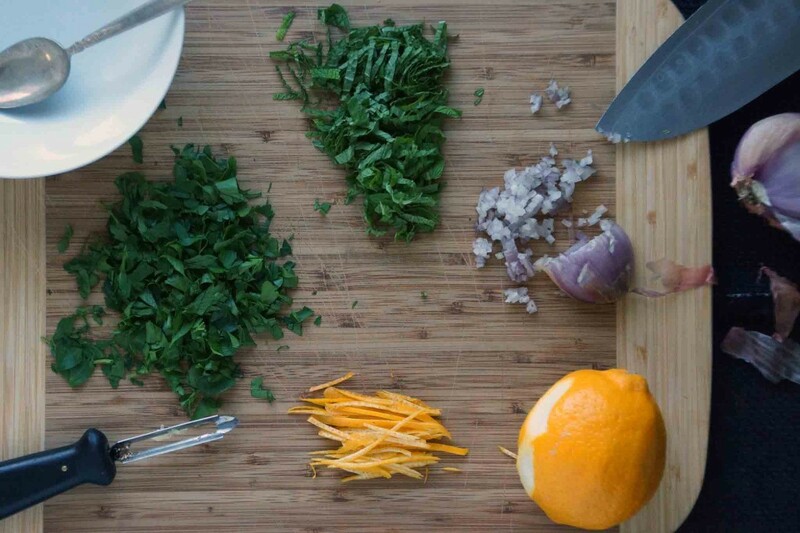 Combine the minced parsley, mint, shallot, and lemon peel in a small bowl and toss. Taste the reduced braising liquid. Season, if necessary, and return the lamb to the pot. 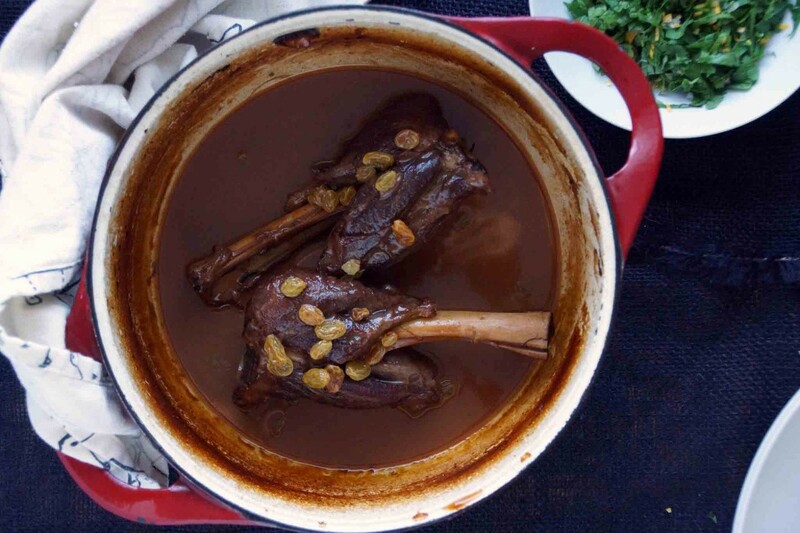 Spoon the sauce and plumped raisins over the lamb. 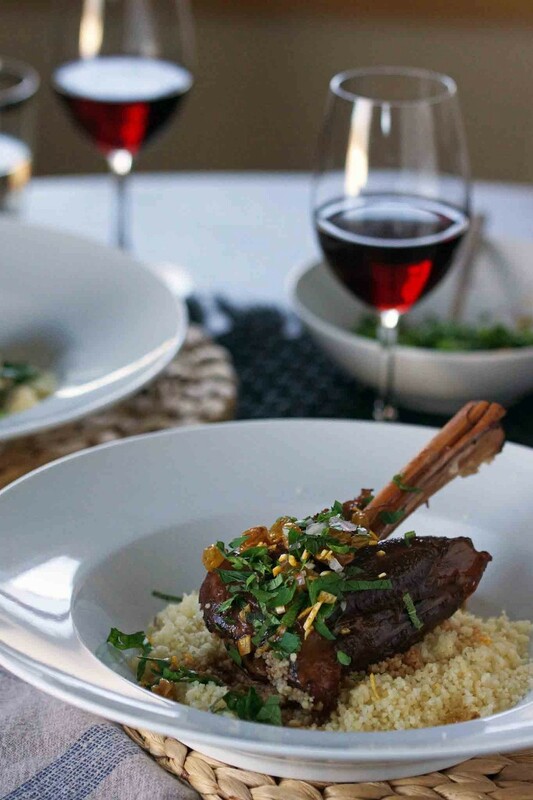 Serve the lamb shanks over couscous, polenta, or a vegetable puree to soak up the sauce. Sprinkle with a bit of the gremolata and pass the rest tableside. 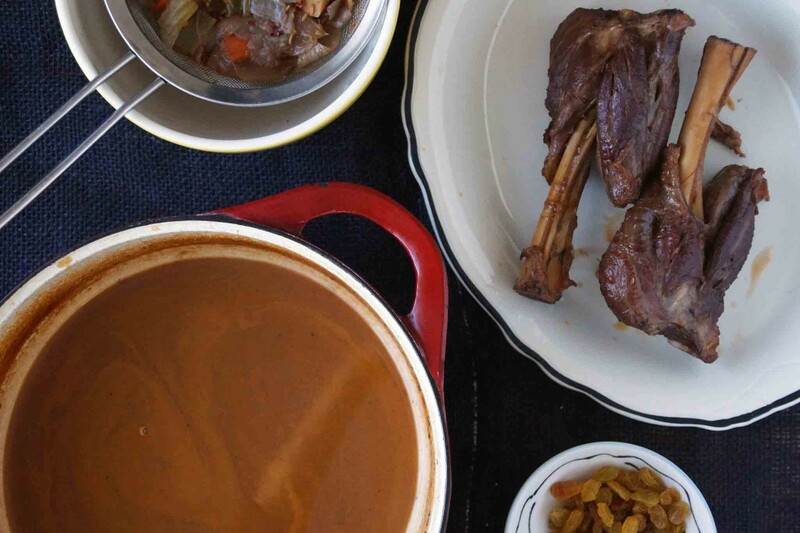 Hey, before you put that Dutch oven away, here are a few more braising adventures to consider! Maybe if he can find a way to incorporate bacon! I’m with you, I just love my Dutch oven! 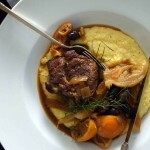 There is nothing better on a cold day than a cozy slow braised dish like this. The fresh ginger and that gremolata puts this over the top. Yum!